There used to be a television game show called ‘To Tell the Truth’. I remember watching it when I was younger. The point of the program was to trick the contestants into believing a lie. They did this by having three participants try to persuade the contestants of their occupation. However, only one of the participants actually held that occupation. The other two participants were lying through their teeth to make themselves seem more credible than the one who actually held the job. The contestants were each allowed to ask the participants questions to get to the truth. But of course, the fun of the show was to see the contestants put their votes on the one whom they thought was telling the truth only to see them select a liar. In today’s post we are having our own game show of ‘To Tell the Truth’. Today we are going to present three different gospels and all three will look like the one true gospel. However, there is only one true gospel. All three can not be right for they will contradict each other. Here is the testimony of the first gospel. This gospel teaches that we are saved by the grace of God for the glory of God by the nailing of our sins on the cross. It is their conviction that we are not tied to the Law of Moses anymore by any obligation to secure our salvation. They site those many scriptures concerning salvation by grace only. Calvinism teaches that salvation is not something that God does in us, but something God does for us. The next gospel teaches that we are saved by the grace of God by the nailing of our sins to the cross, but in order to be saved we need to live a righteous holy life, that our salvation is dependent upon our behavior. That the sacrificial law is dead but not the moral law of Moses and believers are still accountable to live according to that Law or they are not saved. They use those many scriptures concerning remaining steadfast, not falling away, not living in sin as justification for their position. Arminian teach a salvation that God does for us but we need to walk in holiness to keep this hope. The last gospel teaches that we are saved by the grace of God but this grace is not consummated simply by having our sins nailed to the cross. This gospel teaches that in order to experience the true grace of God found in the gospels the believer will not only have their sins nailed to the cross, but their old sin nature too will be crucified with Christ. This gospel teaches, by the grace of God alone, our old sin nature which died with Christ on the cross is now buried with Christ. This gospel teaches, by the grace of God alone, believers are raised as a new creature in creation with the nature of the new Adam, no longer slaves to sin. This gospel teaches, by the grace of God alone, we are saved by the renewing of the Holy Spirit by which we are transformed into His image to walk in the Spirit by which we fulfill all righteousness. If we do not walk in this Spirit of Christ and experience more grace than just having our sins nailed to the cross we are not His. The Gospel According to the Gospel teaches that salvation is something God does in us as His act of doing it for us. Calvinism and the Arminian way of thinking both exclude huge biblical truths when they discount each other as a heresy. Calvinism has no place for those scriptures that teach about the need to be holy because they do not understand The Gospel According to the Gospel. They assume the only way to be holy is to accept what the Arminian teach. That is, holiness is achieved only by obedience to the Law. Arminian who teach we have to obey the Law in order to be saved forget the most important teaching in scripture. Our salvation is by grace. They do understand however that a life without fruit is just as lost as the life that does not confess Christ, which goes against the Calvinist mindset that our behavior has nothing to do with our salvation. The Gospel According to the Gospel teaches that salvation is the act of changing the sinner man, not just doing something on his behalf. By changing the sinner man, which is something we can not do on our own, testifies to a true complete act of God’s grace upon the sinner. It wasn’t for folly that Christ tells us to be perfect as His Heavenly Father is perfect. By the grace of God, Christ has done something in the sinner man to redeem him from the curse of sin and death. According to The Gospel According to the Gospel there is no conflict in scripture when it says by the grace of God through faith we are saved and needing to have fruit in our salvation or there is no salvation. Our being touched by the grace of God is the new man who walks according to the Spirit and not the flesh, having both his sin and his sin nature are nailed to the cross. This is why there is no contradiction in scripture. 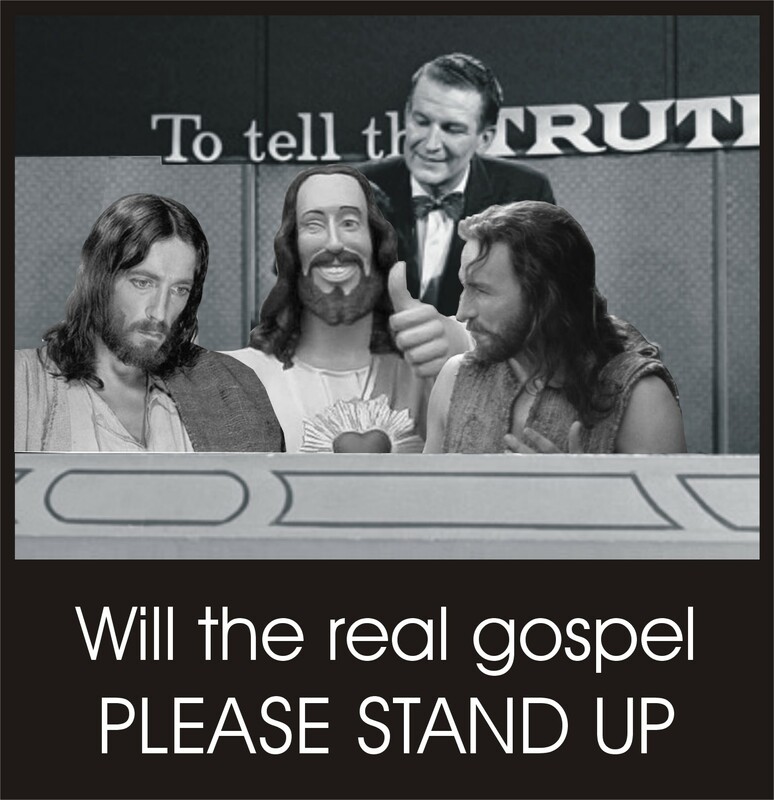 Back to my ‘To Tell the Truth’ analogy, will the true gospel please stand up. Is it the gospel where God does something for us, but not in us? Or is it the gospel where God does something for us, but we in our own effort need to keep the Law to make it complete. Or is the last gospel? The one true gospel is the one where God does something in His people which we could not do on our own and this act of God’s grace is something He does in us, for us! By which we can live the fruitful life in Christ through the Holy Spirit and not according to the effort of the flesh, the sin nature or the Law of Moses. Will the real gospel please stand in in your people. As I have said before, If you do not like the doctrines that use the name of Calvin, I suggest you address that on your blog. As for me I will continue to address those teachings I consider unbiblical from Calvinist, Arminian or anybody else. Just because you do not like the labels they have given themselves of which I use, don’t think me ignorant. Dave: My point is that you are just not “historically” correct or accurate, on Calvin or Calvinism. If you get to read the Calvin bio by Bruce Gordon? you will see my points. Again, this is not a personal attack on “Dave”. But again, both historical and theological. Is the Westminster Confession of Faith part of your belief structure? Yes, to degree, but as an Anglican I would follow more closely both the Anglican Thrity-Nine Articles, and the Irish Articles 1615. Here are the Irish Articles 1615, which for the most part are the work are of the Irish Anglican Archbishop James Ussher. These are in many places close to the Westminster, which of course came later. Thanks for the link, I will look at it when I get the chance. Would you agree with John McArthur who says the Westminster Confession of Faith states… A believer can live in a lifestyle of sin for an undetermined amount of time for an undetermined amount and type of sin and never be in danger of going to hell. Do you believe the Westnminster Confession of Faith teaches this, and if you do, do you agree with that statement? This I would really like to know. I think this is at the heart of some of our disagreement. That would only work in the case of someome who is surely “Elect”. And we just don’t know who the elect are? So if a man is living in sin, and calling himself a Christian, this is not the biblical norm! However, truth be known, we have all of us “sinned” against God, even as Christians! Of course that depth is between us and God. But we don’t even know the depth of our sinful hearts…in ourselves! However, “The path of the just is as the shinning light, that shineth more and more unto the prefect day.” (Prov. 4: 18) That;s our path ‘In Christ’! Dave, I am not sure why you think that Calvinists don’t care about holiness. That is not what Calvin taught, nor is it what the other reformers, past or present teach either. God is holy and calls His followers to holiness as well. They are simply not accepted or rejected based on their performance. Since embracing the doctrines of grace, I am now free to admit sin that I only glossed over before, when was trying to earn God’s ongoing love and acceptance for me. I am now free to pursue holiness with a greater zeal, not afraid to admit failure, knowing that I will fall miserably short of God’s holy standard, but I fervently pursue holiness anyway, as an act of worship the only one who is truly holy. Reformed theologians certainly teach that God does something inside believers too. As a matter of fact, it begins even before we believe and continues on for eternity. They also believe and teach that it is the new nature that lives for the glory of God, empowered by the Holy Spirit and drives sanctification. The fundamental difference in those who embrace the doctrines of grace is that they realize that God’s holy standard doesn’t change after we are saved. Therefore sinless perfection is the only acceptable performance. That means that any wrong attitude or mixed motive, even in my prayers or worship is sin; worthless at best, a damnable offence at worst. So if it is not all of grace, past present and future – we’re sunk. I think the disconnect is that when you speak of being saved by grace, you are speaking of justification only. Salvation is justification, sanctification and glorification. So when the Bible says saved by grace, it’s more than just being forgiven and declared righteous at a moment in time. We are clothed in Christ’s righteousness for eternity. Where we do agree is that those who show no signs of regeneration remain unregenerate and are dead in their sin – I don’t think you will find a Calvinist that would disagree with you. If the unilateral love and free grace of a holy God does not melt your heart, and you are content to live for yourself and your own pleasure even though you now God wants something else for you – you are not saved! Where we don’t agree is that I whole-heatedly believe that preaching grace alone to converted souls will set their hearts on fire with a desire to live a holy lives simply because it pleases the one who paid it all. I have lived both sides of the fence – 18 years trying to stay in God’s good graces by being good, and the last 2 by His grace alone. There is no comparison. My heart yearns to obey more today than ever before – partly because I know He will love me even if I don’t. I never said that Calvinist don’t care about holiness. What I am saying is exactly what you are saying. Ironically you have not refuted any scripture that I put forth to speak of what God has done in us and not just for us. What I am trying to point out is something more than our desire motivated by God’s grace. This comment is a tap dance around the ‘Perseverence of the Saints’ doctrine. According to the Westminster Confession of Faith, a true believer (elect individual) can live in sin for an undetermined amount of time for an undetermined amount of sin and not be catagorized as someone who has no sign of regeneration, this is according to John McArthur. So when I hear Calvinist speaking of God melting their hearts and this is the reason to live holy, it sounds nice and all, but scripture teaches we are holy because we have been given a new nature, where we leave the sin nature in the grave. We actually are changed by what Christ did for us, not just for us. The Westminster confession of faith runs contrary to this. Please do not think I am saying we need to live according to the Law. We are not. What I said in my post, and I am not sure if you read it, is when we live in the Spirit we can not offend the Law even though we do not live according to the Law. Let alone all of the nonsense out in the world of Christianity. So You and I are on the same page when it comes to legalism. But when it comes to the change in the believer that is supposed to happen to the believer, I think we are on two different pages. For sure the Westminster Confession of Faith and I are. Dave: The Pauline, Johannine and biblical NT teaching, does not teach the Christian cannot sin, even after he has received the New Man, or nature. And St, Paul teaches in Rom. 7: 13-25, that the new nature lives together with the old nature. But as Romans 8 teaches the New Nature seeks to dominate in the Christian, but it does not remove this trial and warfare until death. So when Paul talks about the destruction of the body of sin in Romans 6, he is talking about the reality of the full eschatological victory ‘In Christ’. Which will not be visibily seen until that day, before the Lord. Only then, and of course too at death does this warfare cease. So in reality, a real Christian ‘believer is to be known not only by his peace and joy, but by his warfare and distress. His peace is peculiar: it flows from Christ, it is heavenly, it is holy peace. His warfare is as peculiar: it is deep-seated, agonizing, and ceases not till death’. It sounds like we are having a dialogue about semantics. I do believe that Christ’s sacrifice is effective both for and in me. He paid for my sin and granted me His righteousness. Additionally I was previously totally depraved and incapable of responding to His commands, but I have been regenerated by the Holy Spirit and am now willing an able to respond. I am not sure if we differ or not on our ability or need to obey ‘completely’ to remain in good standing with God, I say no. What do you say? That is what I am talking about when I say a heart that melts to obey. I can obey because of what Christ did in me. I want to because of what He did for me. But in all of that I still fall short. That is why I continue to need His grace. I personally am not interested in Calvinism, Arminianism or any other kind of “ism”. What I am interested in is what does the Bible say concerning salvation? Paul says that we are saved by grace through faith and not we ourselves – it is not of works less any man should boast. James tells us that faith without works is dead. What works? Is this the works of the Law? Anyone who teach that we must observe the Law of Moses whether sacrificial or moral does not understand the Gospel. Heb 7 tells us that the Mosaic Law as of the Levitical Priesthood. But because there was a change in the priesthood a change in the Law was also necessary. Christ is now the High Priest after the order of Melchizedek and there is indeed a new Law in Christ. For Heb 8 tells us the old law decays and is ready to vanish away. How then do we obtain salvation? Grace created the way that we can come to faith in Christ. If we have faith Christ works in us through faith to obey the new Law that is no longer written on tablets of stones but written upon our hearts. This is what God pursposed when He spoke to Jeremiah the prophet in Jer 31:31, reiterated in Heb 8. The assumption that Christ did it all so that we do not need to do anything is incorrect. Christ calls us into obedience to His commandments – commandments that incidentally are no longer taught in many churches. Paul says work out your own salvation with fear and trembling – We do not work for our salvation per se but faith plus works equals salvation by grace. If we love Christ we will obey His commands. We cannot claim to have faith and not obey otherwise our faith is dead (James 2) and therefore we cannot be saved with dead faith.